In an all out effort to boost his prestige abroad, President Obama has decided that his apology tours were just not as effective as he hoped and he has decided to become more indispensable to foreign leaders. 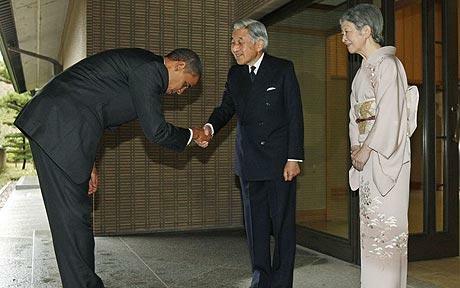 At over six feet tall, the US president was photographed bending to nearly a 90 degree angle when he greeted the relatively diminutive Emperor Akihito and Empress Michiko at the Imperial Palace on Saturday. I, quite frankly, believe that there is a little more going on here than the Telegraph was willing to report. Obama had previously tried out his new foreign policy in Saudi Arabia when he visited King Abdullah. Only time will tell if this new policy of 'engagement' will reap any benefits for the United States. The image conscious National Football League, which determined that Rush Limbaugh was not worthy enough to become one of its illustrious owners, fined Tennessee Titans' owner, Bud Adams, $250,000 for giving the bird to Buffalo fans a number of times as he celebrated his team's win over the Bills. In an article published online by CBS Sports, they reported that the "NFL has had 460 incidences of players having run-ins with the law between 2000-present." Rush Limbaugh would have certainly added a lot of class to this group of infamous citizens that includes Plaxico Burress, Ray Lewis, Pacman Jones, Ricky Williams, Michael Vick, and now Bud Adams, to name just a few. The Indianapolis Colts beat the New England Patriots 35-34 Sunday night to remain undefeated (9-0). While the government is reporting that the official unemployment rate is at 10.2%, the New York Times is reporting a much bleaker, albeit unofficial, figure here. In all, more than one out of every six workers — 17.5 percent — were unemployed or underemployed in October. The economic stimulus that the Obama administration is overseeing is obviously not working. If anything is going to help get us out of this economic meltdown, tax cuts and incentives for the private sector to hire new workers would seem to be the answer to the increasing number of unemployed workers. Unfortunately, I don't believe Obama has the vision to see beyond his never-ending quest for undeserved income redistribution. After taking nearly one million dollars from the Republican party in her bid to represent New York's 23rd congressional district in Congress, 'Republican' Dede Scozzafava saw the hand-writing on the wall and withdrew from the race over the weekend, then promptly endorsed the Democratic candidate, Bill Owens, over Conservative Party candidate, Doug Hoffman. One can only wonder if she is related to Senator Arlen Spector (Ex-RINO - PA).